Gambling in online casinos using Bitcoin and other crypto-currency has become a very popular choice for many gamblers. They are choosing this platform because of the easiness and anonymity along with a good security the casinos can offer. The popularity of crypto-currency is rising day-by-day, and so are the number of online casinos. Most of the casinos offer typical games only, such as Dice or Slots. But we here, at crypto-games.net are trying to add as much variety of unique games as possible. Plinko is one of our latest addition. Very few casinos out there offer plinko, as such little is known about this game. Most of you may already hear about Plinko through the popular television game show “The Price is Right”. Plinko in our casino follows the same mechanism as the television show. It’s a very simple game and easy to play. Here the Plinko is a pyramid shaped board and made up of a field of pegs. A ball is released from top of the pyramid and as the ball falls, it is deflected by the pegs. The user pay-out is defined by the slot the ball falls into once it reaches the bottom of the pyramid. There are four kinds of ball (green, red, blue and yellow) you can choose to drop. The minimum bet amount is 10 credits. 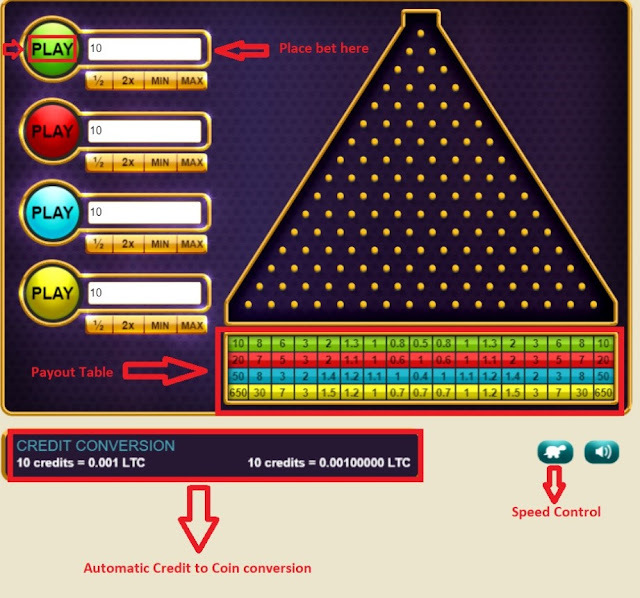 Coins are automatically converted to credits and the conversion table can be seen below the Plinko board (refer to the picture above). To start playing, place a bet on one of the ball and click “Play”. Sit back and watch the ball fall. Once the ball reaches the bottom and falls into a slot, you will get paid based on the payout of that slot. The slots at bottom corner of the pyramid have higher payout but the probability of hitting those slots are lower compared the slots at situated at the middle. You can also control the speed of the fall by clicking the “Speed control” button (please refer to the picture again). The tortoise slows down the fall and the hare speeds up the fall. You can drop more than one ball at once by clicking the “play” button as many times as you want. The Green ball has a house edge of 1.63% with maximum x10 payout. The Red ball has a house edge of 1.84% with maximum x20 payout. The Blue ball has a house edge of 1.52% with maximum x50 payout. The Yellow ball has a house edge of 1.91% with maximum x650 payout. All bets made at Plinko can be verified through the provably fair tab. Plinko is a fun and easy game to play. It is more fun to chat and play with your friends here at Crypto-Games.net. So, head over to Crypto-Games.net and start playing plinko now!